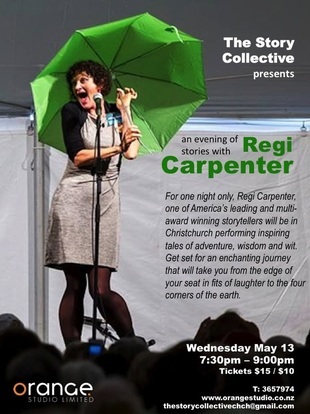 A huge thanks to Regi Carpenter from the US for stopping off at Christchurch on her way to the Southland Arts Festival. Regi fitted a lot in to her brief visit. On her first day she stepped almost straight off the plane from the US and into a workshop on storytelling for children – a collaboration between The Story Collective and CCC Libraries. The next day Regi had the Canterbury TV staff in hysterics with her dog walking story followed by a delightful interview. Then in the evening she enchanted a full house at Orange Studio with tales of growing up in Clayton, on the St Lawrence River in up-state New York. We hope that Regi will return one day to lift our spirits with more of her wonderful tales.